Sean McElwee: Jeff Sessions is on the wrong side of marijuana legalization. Can Democrats take advantage? Sean McElwee Jeff Sessions is on the wrong side of marijuana legalization. Can Democrats take advantage? Sessions' anti-marijuana stance opens up a big window of opportunity for Democrats in midterm races. As California moves forward with full legalization of marijuana and more than half of U.S. states have legalized medical marijuana in some form, the issue is becoming an increasingly potent force in American politics. Now comes news that Attorney General Jeff Sessions is reportedly rolling back a President Obama-era policy that allowed states to legalize marijuana despite federal law prohibiting it. Sessions — and therefore by proxy the Trump administration — is clear on where he stands on the issue of weed. And increasingly, he is not standing on the same side as the American people. To put it simply, liberals’ slow evolution on the issue is hurting the party; It’s clear Democrats could easily turn marijuana into a winning issue. According to Gallup polling, 64 percent of Americans now support legal marijuana, and the issue polls well across parties: 72 percent of Democrats, 67 percent of Independents and 51 percent of Republicans now support legal marijuana. The issue is a smart play for several reasons. First, it has the potential to fire up the liberal base at a crucial time, particularly the young voters that Democrats need to win in the 2018 midterms (when the electorate is often older). I analyzed American National Election Studies 2016 data, and found that 61 percent of Americans support legalizing marijuana (excluding individuals who said “don’t know”). Legalizing marijuana was particularly popular with under-40-year-olds, according to the data I analyzed, with 74 percent supporting legalizing marijuana; 53 percent of those 40 or older also support legalization. Marijuana would also allow Democrats to show their commitment to criminal justice reform. While no one believes that legalizing marijuana would solve mass incarceration, studies show that though black and white people use marijuana at similar rights, black people are 3.73 times more likely to be arrested for marijuana possession. Democrats have been hurt by low turnout among young people of color, and a meaningful commitment to rolling back the so-called war on drugs would send a welcome signal. It’s not surprising that Cory Booker, a young progressive Senator with an interest in criminal justice reform has centered marijuana legalization in his legislative efforts. Legalizing marijuana would also be an effective way to fund important Democratic initiatives. In Colorado, the revenues from legal marijuana have topped $500 million, money that could easily help support progressive priorities like universal Pre-K and affordable college tuition options. Marijuana has the potential to fire up the liberal base at a crucial time, particularly the young voters that Democrats will need to win in the 2018 midterms. But firing up the base and proving their progressive bonafides won’t be enough if Democrats really want to retake Congress. For the party to regain the House Majority in November, they need to compete beyond the suburbs. Rural districts in Trump country and working-class districts in the Midwest offer potentially compelling pick-up opportunities, and Democrats are already targeting dozens of them. Some of these areas appear to be rapidly souring on Trump and Democrats are gaining ground in dozens of House races. But to win, Democrats still need to find issues that will play well in these districts. Marijuana could be such an issue. In one Kentucky congressional district, polling he commissioned from Public Policy Polling found that 56 percent of voters think that marijuana will reduce addiction to pain pills, compared to only 26 who think marijuana is a gateway drug (the rest were undecided). 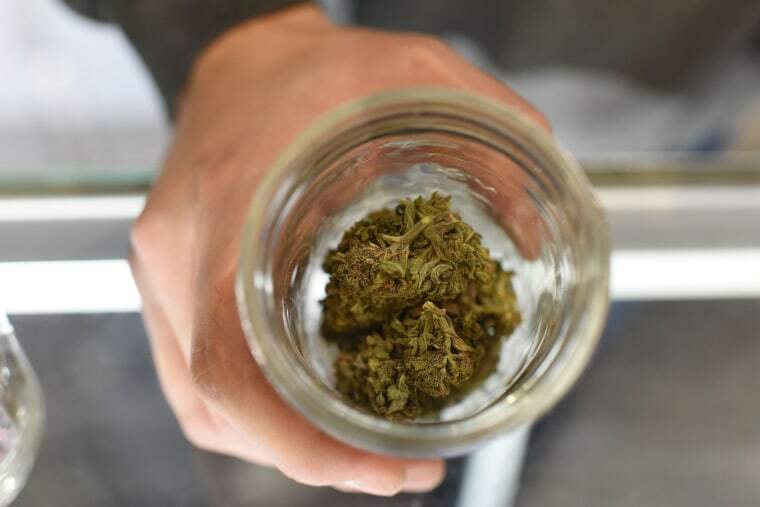 In that district, 68 percent of registered voters think doctors should be allowed to prescribe medical marijuana, with 24 opposed (the rest were undecided). This polling also tracks with attitudes slowing percolating in conservative circles as well, like this commentary piece written by Cato Institute visiting senior fellow Ike Brannon. Kendra Fershee, a law professor running in West Virginia's 1st district, a region Trump won by 49 points, recently put out an ad arguing that medical marijuana could help end the opioid crisis and bring revenue to the state. Fershee tells me that she intends to "fight for the federal government to get out of the way" of the citizens of West Virginia. (West Virginia became the 29th state to legalize medical marijuana last year). Fershee hopes this states’ rights framing could lead skeptical independents and even Republicans to support her. And she's not the only candidate trying to use weed to appeal to traditionally conservative voters. Richard Ojeda, a candidate in West Virginia's 3rd district who sponsored the bill in the state senate to legalize medical marijuana, cut an emotional ad that included a man with testicular cancer who used medical marijuana to alleviate the pain of chemotherapy. In Indiana’s 9th district, one of the dozens the Democratic Congressional Campaign Committee says it will focus its efforts on in advance of the midterms, civil rights lawyer and candidate Dan Canon tells me, “I talk to someone that’s lost someone to overdose here once a week.” He’s aggressively championed legal marijuana, both as a palliative to the opioid crisis and a necessary step to racial justice. With so many upsides, it remains unclear what, exactly, is holding Democrats back. This is no longer a polarizing issue, and there is plenty of polling that indicates its widely popular. Some ambitious politicians, like possible 2020 candidate Booker, have already seen the appeal, which is certainly a step in the right direction. New Jersey Governor-elect Phil Murphy campaigned on the issue, and will likely sign a legalization bill early in his tenure. On the right, some Tea Party conservatives like Senators Mike Lee of Utah and Rand Paul of Kentucky see it as a way to distance them from establishment leaders like Attorney General Sessions. But to really set their sites on large-scale change, top Democrats need to stop being so squeamish and lead with weed. This isn’t about being cool or hip, it’s about positioning themselves on the right side of an issue with important criminal justice, racial equality and revenue opportunities. Sean McElwee is a researcher and writer based in New York City. He tweets at @SeanMcElwee.